Longtime fan! My snack needs are all over the place. Sometimes I just want a little something to tide me over, but other times I’m looking for a more substantial snack. Any recommendations outside of the usual supermarket picks? I’ve got a knack for snacks. They can be anywhere from a few calories to a mini meal. These finds are extra special and ALL available on Amazon! I’ve broken ‘em down for you: snacks for 100 and 200 calories or less. 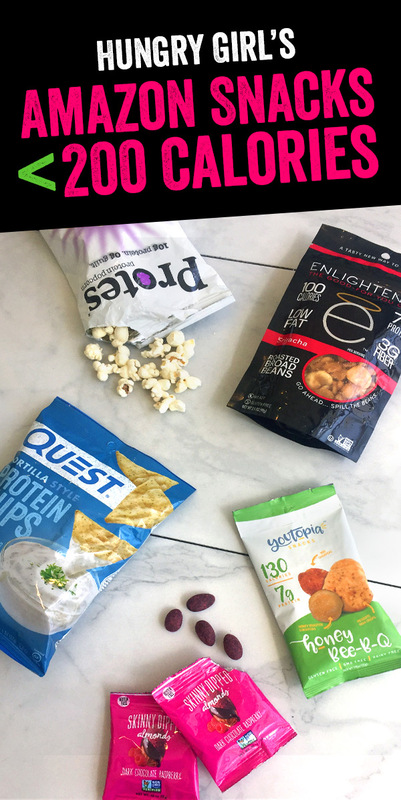 And for more snack finds, plus snack hacks, snacking advice, and my ultimate SNACK AWARDS, check out “The Snack Attack Episode” of the Hungry Girl podcast! Stock up, and snack to it! We hope you love these finds as much as we do. And just so you know, we may receive compensation from some of these links. Happy National Blueberry Muffin Day, July 11th! This calls for a batch of Blueberry Streusel Muffins. Make someone’s day… Click “Send to a Friend” to share these snack finds!